Denise Bennett reads aloud from a letter outlining the reasoning behind and terms for her paid administrative leave, in a Jan. 29, 2019 live video. The University of Idaho sent out a campus alert Wednesday, Jan. 30, warning that Denise Bennett had been barred from campus and indicating alleged drug use and access to weapons, but failed to mention that there was no indication of a threat to the university from the tenured teacher, or that the information included apparently came from a November police report. Bennett, a tenured associate professor in the University of Idaho school of Journalism and Mass Media (JAMM), was placed on administrative leave Thursday, Jan. 24, after an incident with a dean and another staff member. 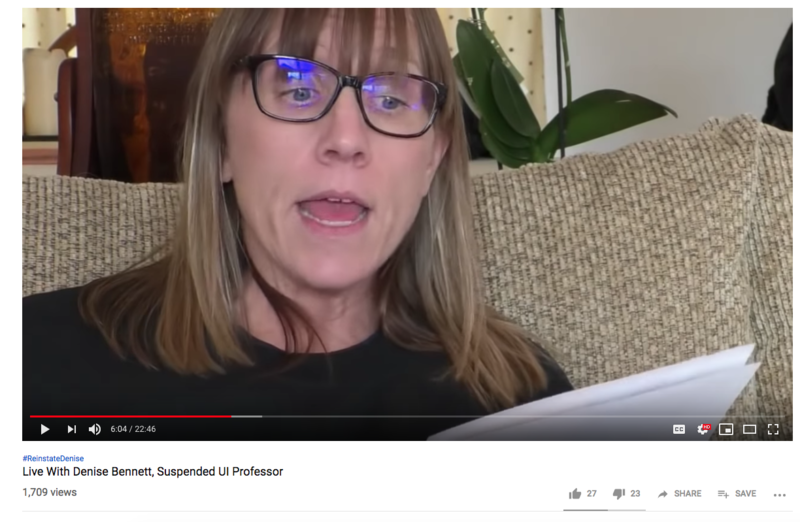 According to the official university letter sent to Bennett this week, which she read aloud in a live YouTube video on Tuesday, Jan. 29, her paid administrative leave is "not disciplinary." However, according to the letter, it does have to do with the way Bennett spoke with and acted toward Sean Quinlan, dean of the College of Letters, Arts and Social Sciences (CLASS), and another employee. "You are being placed on administrative leave because of your unprofessional conduct with myself and another university employee," the letter from Quinlan states. "Specifically, your actions of raising your voice and accosting a university employee who was attempting to perform the functions of her job." In the video, Bennett offers sparse details about the interaction, but does say she raised her voice at the employee and Quinlan while defending a student. Throughout the video, she raises her voice and uses expletives to express frustration with the administration and university, and makes it clear she regularly uses a loud voice with her students, and doesn't feel she needs to act differently with fellow employees. She also reads the text of an email she sent administrators making use of caps lock and profanity to complain about bureaucracy within the university, issues in her department, and to say she wouldn't be attending future meetings. In particular, she mentions issues with using grant money she'd obtained. "I will spend every goddamned penny of grant money I can because this project isn’t done, there’s always things I can apply money to, like equipment!" Bennett reads from the email in the YouTube video. "Because God and Satan know there’s no way in hell CLASS or UI is gonna fork over money for faculty and students in JAMM to get gear." Students who wanted to defend Bennett and demand she be reinstated and allowed to teach classes again had planned to hold a sit-in on Wednesday afternoon in her honor, but they cancelled the protest after receiving a campus-wide Vandal Alert. The alert read: "Vandal Alert: Denise Bennett has been barred from Moscow Campus. Recent admittance to police of meth use and access to firearms. If seen on campus, call 911." The group planning the sit-in said it wanted to temporarily postpone the sit-in while it got more information, but still seemed supportive of Bennett. "Univ. of Idaho Professor Barred from Campus for 'Meth Use, Access to Firearms,'" KREM posted. "UI Bans Journalism Professor from Moscow Campus, Alleging Meth Use, Access to Guns" the Spokesman-Review headline read. The thing that wasn't immediately made clear was that the alleged meth use and access to a weapon was reported to Moscow Police back in November. That information was obtained by Moscow Police while responding to a report of a domestic disturbance, acting Chief Tyson Berrett told Pullman Radio News. There's no indication that interaction with police resulted in criminal action, and Berrett told Pullman Radio News she is not wanted by police. Berrett did not respond right away to multiple messages seeking comment Wednesday afternoon. The Police Department gave that information to the university on Wednesday, says Jodi Walker, communications director for the university, as part of a regular update that happens whenever there's an issue with a student or faculty member. "The alert was issued as a precautionary measure," Walker says. When asked if it is standard to include the name of a person who may be a threat to campus in a Vandal Alert, Walker said, "It's important to us to provide the safest environment possible, and giving people as much detail as we can so they can be aware of the situation around them is important to us." That said, Walker says there was no indication of a direct threat to campus, the university, or an individual. But the university did want the students planning the protest to be aware. "We fully support their ability to support her and protest and make their feelings known, but we wanted them to understand the potential safety concerns involved," Walker says. "There's concerning behavior that when coupled with a gathering of students and the info we had, heightened our awareness that we needed to let our community know what’s going on." Bennett did not immediately respond to a Facebook message seeking comment, but the Inlander will update this story as more information becomes available. "The alert contains little context. Students unaffiliated with the JAMM department wouldn’t likely recognize Bennett by her name alone, especially if they have not been following the news of her suspension. It explicitly mentions drugs and firearms, urging the recipient to call 911 on sight. The alert leaves out, however, that these drug allegations come from a November police report and that there are no direct threats to campus or students. Any reasonable person receiving this alert would assume it implies a clear and present danger to anyone on campus. Evidently, many did. Professors have cancelled classes, and the JAMM department has closed the Radio and Television Center, blocking students from accessing equipment and editing bays. We would like to warn President Staben against speech that endangers others (i.e. shouting ‘fire’ in a crowded theater) or causes panic among the students and faculty. As the student organizing behind #ReinstateDenise has shown, the JAMM department has successfully educated a large group of young media professionals. The handling of the incident, however, calls into question the administration’s competence and their commitment to the success of our students. We will continue to stand with Associate Professor Denise Bennett and protest the negligent behavior of our university administration." The students planned to march to the administration building at 6 p.m. Wednesday. This post was updated Thursday, Jan. 31, to correct the spelling of Tyson Berrett's name.